Sorry, we are currently sold out of 'Unusual Mediterranean-Blue Apatite Small Nuggets'. Please check back later. Price is per 16-inch strand of these unusual beads. Each of these beads is slightly different shape and size, but largest average measures about 9mm x 6mm x 5mm - many in the strand. 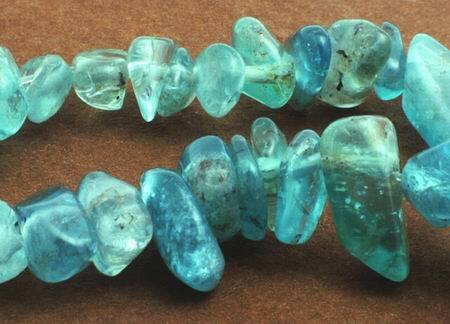 Chemically apatite is calcium phosphate, the same mineral teeth are made from. The stone is associated with the Western zodiac sign of Gemini. Apatite is said to motivate, bring peace and harmony and fight viruses. A balancing stone that can help emotional, mental, physical, and spiritual bodies. It is said it decreases appetite, making you less hungry! It is said to clear chakra blockages, stimulate the "knowing centers" and strengthen intuition.